It’s been a while since I’ve touched on the topic of less waste, but there’s nary a day when I don’t think about our environmental impact nor is there a day that I haven’t spent every fiber of my being to reduce my own carbon footprint. We’ve cut our plastic purchases drastically since starting this intentional life, refusing to buy groceries in plastic packaging, avoiding takeout, and carrying our own reusable cups, utensils, and to-go containers. But still, I wanted something next level. What many people view as waste is actually a source of nutrients. The only real waste is the by-product of non-organic and non-biodegradable stuff, which we’ve tried to cut out of our life. Now that we’ve limited non-organic materials in our household, it’s time I turned my eyes, and this blog’s attention, towards composting. It isn’t something recent. I have been in search of composting options in Orange County for almost a year. Tales of composting services in grander metropolitan cities had me enamored. I was imagining a life of compost bins in freezers with weekly (or monthly, I’m not picky) pick-up services. I was drooling over the idea of a local drop-off site that I could walk to. Alternatively, dreams of connecting with local farmers as I help create fertilizer for their fields materialized. Unfortunately, those thoughts were immediately dashed upon the realization that there are no public composting options in Orange County, AT ALL. I had called the Department of Waste Management, admittedly on multiple occasions, only to be told that there is no current existing composting service and neither will there be one in the near future. I asked the HOA if we could create a composting program in our community. I reached out to local farms, and despite having their own composting activity at their site, they could not welcome more composting from the public due to limited facilities. I read, called, spoke, to no avail. It was time to take matters into my own hands. We currently live in a two-story loft with no land of our own. Research regarding composting generally led to the reminder that we are lacking garden space (see also: fruit and vegetable garden patch dreams). And while I’ve come across posts on how to compost in a plastic bin numerous times, I had my doubts. Yet, here I am. Desperate times, I suppose. Or rather, it’s about time I stopped wallowing and started doing. As with any first-time experimental venture, I did “extensive research”, which really only entailed googling the words “at-home-compost” (or something to that effect) and reading the first few websites. Thankfully, a sweet girl that I had met at a local farm tour dedicated some time to walk me through the entire process and patiently answer my questions. She began the conversation with, “For many people, it is very difficult to get composting to work in an apartment space.” Challenge accepted. I purchased a lidded plastic bin (the irony doesn’t escape me), with drill holes in the bottom of it that remains open to another tub that catches, who knows what. Dirt perhaps? Runaway worms? Oh yeah. That’s the part I forgot avoided to mention. It’s a worm bin. I took some dirt from the aforesaid farm’s existing composting site at the lovely girl’s suggestion, in the hopes that I’d also gather some hidden worms in the process. To my dismay, they weren’t so hidden. To my other dismay, they also weren’t quite enough, which then required me to purchase worms from a farm supply store in Orange County. I picked up 300 Red Wiggler Worms, and the name itself gives me the goosebumps. I’m not the girliest of girls, but snakes and eels are my biggest fears, and worms and other legless things are close contenders. But they are enthusiastic eaters, eating their weight in waste per day, so I knew they had to be the ones. I walked away from the farm supply store holding a bucket of worms at arm’s length. That’s how determined I was, yet not so determined that I didn’t wait for my husband and roommate to get home before having THEM do the transferring of worms from one bucket to the other. Before detailing how to fill the bin, may we dissociate from what can and cannot count as compostable materials? Two types of waste can enter the bin: green waste and brown waste. Green waste includes things like coffee grinds (aplenty at our residence), egg shells (a common by-product of a baker), and vegetable and fruit peels and scraps. It is imperative to point out that not all food waste can go into a composting bin. Meats, dairy products and oils are foods that one must avoid putting in the bin. Brown waste, on the other hand, involves things such as egg cartons, cardboard, paper, and dead leaves fallen from indoor and outdoor houseplants. It should go without saying that anything with a plastic film cannot be de-composted. Setting up the bin is theroretically easy. It involves a layering process. The formula that I followed was a layer of brown waste at the bottom, followed by a layer of dirt from the farm. I then placed a layer of green waste, followed by Red Wiggler worms. After the worms, I added a layer of moist brown waste that covered the bin entirely and was at least 2-3 inches thick. Subsequent additions to the compost bin require a layer of green waste, topped by 2-3 inches of brown waste. Since our bin has limited space for a household of three people, we maximize our layers by placing a bowl in the freezer to collect green waste over the course of a week. The freezer keeps the green waste from rotting until we add it to the bin. Junk mail and egg cartons as well as cardboard have been sufficient in providing the necessary brown waste, which we collect in an old shoe box in the garage. Aforementioned research indicates that frequent turning of the soil will improve the de-composting process. We plan to turn the soil at least once a week, just before adding more green waste, using a trowel. For the brave, bare hands or a stick will do. Airflow is equally important. By using brown waste that are a bit bulky (shredded newspapers and weirdly shaped egg cartons), we allow air flow to occur. We never mash down the brown waste when we add it. I have also read that too much of one thing will prevent a successful compost bin. You don’t want a bin dedicated entirely to coffee grinds. It’s helpful to add a variety of green waste, to provide a large array of nutrients to the soil. So now the question to address is where to keep such a bin in a tiny home? Suggestions included underneath the sink, but the thought of flies and bugs and worms in the kitchen will prevent me from peaceful sleep. Another suggestion was outdoors, but since we only have a tiny balcony, we decided against it. Plus, I think outdoor bins may attract more bugs and flies than indoor bins. Eventually, we settled on the garage, in the hopes that people were honest in saying that composting does not result in flies or stray worms. Only time will tell. Overall, the process to set up was easy. I think the hard part comes next. Just as learning to understand plant growth takes time and experience, so too will composting have a learning curve. Some cons include limited space in our bin, which may run out more quickly than in other households considering how we cook everything from scratch. Another downside is the need to spend money in order to get this set up. It isn’t expensive by any means, but it isn’t free either. Lastly, the need to purchase a bin of some sort irks me. Plastic seems to be the best material, but I haven’t calculated whether the composting process would offset this initial ‘investment’, if successful. Updates coming your way soon. For those in OC wondering where we got our bin, visit the ecology center in SJC. Early mornings speak to me, and always have. This isn’t to say that I have always been the first one up at the crack of dawn. That would be my sister. And admittedly, I have a history in my family of sleeping in when I can. But I am the person who is quick with getting up. Not in the rushed sort of way, but when my eyes flutter open and I wipe away the sleep, my energy levels are already almost at one hundred percent. There isn’t any need to roll around in bed, dawdle in the covers, pretend that it was still night time. And stepping outdoors in the wee hours when the sun has just peeked over the horizon to lend the few stray rays of light is probably one of my favorite feelings in the world. Granted, it’s California, and there’s no need to fight off a bone-shaking cold (most of the year, anyway), but there’s something about the way mornings smell that really attracts the soul. It smells fresh, and full of opportunity. As of late, I’ve definitely honed in to a new early morning routine what with taking on the early morning baker’s shift at Rye Goods. Three days a week, I begin my days at one thirty in the morning, early enough for the late night party-goers in downtown Santa Ana to still be mingling back to their cars on their way home. Although the getting up is a bit rough, I set my alarm at the very last second so that there isn’t any other choice but to get up right away, and once I’m up, I’m going. My first few hours of the day entail baking off over one TWO hundred pastries and loaves with a fellow baker. This may seem like a fast-paced job, but there is a slowness to bread that only a baker will understand. Our mission: to be finished with baking by five thirty in the morning so that the delivery crew can get these baked goods to local coffee shops in time for opening. Our job: a smattering of duties that requires presence of mind, but at the same time, has become memorized by rote motions. The danishes get a dash of sugar, the cookies get sprinkled with sea salt, but oh, do remember that there are five minutes left for the pop-tarts before they start to turn too dark of a color. We have a timeline, but the baking can’t be rushed. The pastries will proof on their own time, the bread will take almost half an hour to rise, and you can’t cut the banana bread until it’s calm and cool. At six in the morning, I leave the bakery smelling like bread, and you would think, tired from lifting trays of pastries, juggling sixteen lodge pans, and washing a ton of dishes. But in general, I walk out with a smile on my face to the sound of birds chirping as they wake to greet the morning sun. I see the lights inside neighbors’ homes, turned on as they prepare for a day of work. I catch a hint of the first few rays of morning light. Sometimes, I even finish my shift before the sun is ready to get up. I walk to my car with a sense of peace. On these mornings that I bake bread, I come home to a cat, ready and begging for his breakfast, and a still sleeping husband who stirs when I walk up the stairs. I feed the cat, turn on the coffee machine in case it’s an espresso kind of day to allow it to heat up, and feed my starter. I’ll either do a smattering of movements around the kitchen, like put away last night’s dishes or organize a few things, or sometimes I’ll change out of my bakers clothes and sidle into bed for thirty minute rest before my husband wakes. When he gets up for work, I usually get up, too. I prepare breakfast, pour coffee if needed, and write down a to-do list in my planner. We prepare our lunches (usually, baker days are my days off from dentistry), sit down for breakfast, and talk about what we have for the day or what we dreamt of at night while sipping from mugs of coffee. Occasionally, our roommate joins us as she prepares her lunch prior to heading off to work. By eight thirty, they both leave for work, and I wash our dishes, pick up the the cat litter, clean around a bit while my energy is still high, and then when the house has quieted from the absence of both my husband and roommate, I lie down to make up for lost sleep and nap for a few hours. On days when I am not a bread baker, I also practice slow mornings. After a good night’s sleep, I wake up around the same time that I would be getting home from my bread baking shift. If I am a bit sleepy, the cat is sure to let me know that it’s time to eat. I usually slip out of bed, and the first thing I do is pick up the glass of water by my bedside. I finish the left over water, which usually is full from when I’ve placed it there the night before, and walk to the kitchen counter while the cat runs and meows. I refill his kitty bowl, and when he’s busy eating, I refill my glass, and walk slowly back to bed. The cat will join us when he’s done. It is at this time that I pick up the book that I had lain on the floor by my house slippers, and open it up to read. If I’m lucky, I’ll get thirty minutes before my husband wakes. Thirty minutes of reading is a habit that I started to require of myself this year. It’s a way to give myself that self-care. Thirty minutes is never enough. By the time my husband is out of the shower, we repeat some of the same activities that we do on my days off. However, once the morning conversations and tidying up has ended and the house is all to myself once again (my dentistry shifts don’t usually start until 11am), I usually sit down on my yoga mat and do my daily hour of yoga in the first few hours of my day. (On baker days, I reserve yoga for the first few moments after I wake up from my morning nap). I don’t do yoga as a chore to be done, another check box to be addressed, another golden star next to my name. I do yoga to take stock. To notice how my body is feeling, to gauge how I should treat myself for the rest of the day. If there’s a soreness, then I need to be slower in my movements. If there’s a tension, then I need to be lighter in my mood. If there’s impatience, then it’s a day to practice grace. Once I’ve figured out what I need for the day, it begins. I sit down at my computer and write. Not always for this blog. Sometimes for others, sometimes, only for myself. Sometimes I pick up a pen, and other times, I turn on the screen. Not always in paragraph form, sometimes I write short poems to share, mini-monologues for Instagram, lists of dreams for my planner. Sometimes, I even do the bland and write e-mails. And therein lies another habit that I gift myself. First the reading, then the yoga, now the writing. All of these I try to do daily, and all of these I sneak into my morning routine. Notice that when you add bread to the mix, I essentially do everything that I love in during my first few waking hours. I set up my day not for success, as would be ideal for most people, but for a bit of happiness, a bit of calm, and a whole lot of life. I make a huge effort to not pick up my phone in those first few hours. The phone used to be the first thing I touched when I opened my eyes. It’s the first thing people do, judging from how many people view my Instastories after an early morning baking shift. Don’t worry, I’ve been there too. But embracing slow-living means avoiding the fast-paced interruptions of social stories, advertisements, and overall digital consumption that goes hand-in-hand with a phone. In fact, since we’ve moved to this home (six months ago! ), my phone has not rested at my bedside table, but rather, at a far-away-sill where one must get up with awareness to go and pick it up. I also make an effort to not open my emails until I’ve done other things. I’m not ready to jump straight-away into doing what other people need from me. I want to have the time for myself, for my life. The e-mail requests can wait a few hours. My mind needs the reset. Lastly, I like to avoid additional noise. My sister and brother love to turn on music in the mornings, especially during their morning shower. My husband loves to peruse reddit and watch videos once he can pry his eyes from sleep. My dad turns on the TV. I avoid all forms. I’m not exactly a music hater but for the past few years, I’ve really embraced the silence. Even my commute to work is quiet. I would occasionally listen to a podcast, but most days, I drive without distraction. I’d prefer to be without cacophony. So it makes sense that no music plays in the early mornings. The sounds you would hear would be the birds chirping, the cat meowing, the cars on their work commute driving by the window, the keyboard click-clacking, the coffee dripping, the sound of me crunching on a slice of toast, and maybe the computer humming. It goes without saying that the early mornings are for me, and me alone. And that slow living requires not so much that you do things slow, or that you do less. Only Instagram would have you believing this is so. Slow living is really, at the root of it, about intentionality. And I live every morning with as much intention as I can muster. Only the most important things are allowed in those first few hours. It sets up the rest of your day for, maybe not success, but something much more important which is happiness. Whatever happens to the rest of the day happens. But it’s nice to know that by 9am, you’ve already lived your very best. More importantly, what about you guys? Morning routines to share? Every two years, around this time, I chop off my hair. I have been doing this since I was in my early twenties. It’s an act against vanity, as well as a reminder to be gracious, giving, and humble. When I was a really young girl, I was always asked the question, “What do you love most about yourself?” Not socially aware enough to say non-physical traits (I wish I was wise enough to say “my smarts!” or “my courage!”), I always answered with “My hair.” Mostly, it was socially learned. Adults would always croon over my hair, begging to braid it or comb it. They’d exclaim how long, straight, and glossy my hair looked, how well it behaved. No one ever wanted to croon over my smarts. In middle school during my pre-teen years, I would wake up at 6 a.m. every day and curl my hair with a curling iron. I learned how to curl my hair at 12 years old. It would take me an hour or so, which wasn’t bad considering I had so much of it and I had not-so-nimble child-like hands. My hair is stick straight, so by the time I showered after school, I would have straight hair again and I couldn’t wait to re-curl my hair the next morning. Oh the joy of being young and having so much time on your hands! When I started high school, I always had my hair done up. I would check my hair during every break to make sure it still had volume, and would curse the weather (or the gods) whenever my hair fell short. I took pride in getting haircuts frequently, every month or so, and changing up my hairstyle often. At some point, in high school, I read the book The Little Women. When I read of Jo sacrificially cutting off her long locks in order to buy medicine for ailing Mr. March, a chord struck. I started noticing advertisements of children with illnesses, adults with cancer, elderly people suffering from alopecia. I felt oddly sickened by my own behavior towards my hair, the way I prize it, revere it almost. In a way, I was made aware of my vanity, and knew that I wanted to live a different way. So I chopped off my hair. I packaged it neatly and sent it in to Locks of Love. The first time I did this was in my late teens. In my early twenties, I decided to start making it a habit. I would dutifully grow my hair to a long length, only to cut it again. Typically, it takes me two years, and the yearning to cut it falls somewhere around the New Year. Sometimes, I want to cut it or trim it when it’s in it’s awkward stages, but doing so slows down the re-growing process, so I resist. Sometimes, when it’s short, I want it to stay short, but I don’t allow myself the luxury. And sometimes, when it’s long and I am heading in for a haircut, a small part of me wishes I could keep it long for a while longer. But the urge doesn’t last. Cutting my hair keeps me grounded, and it keeps me humble. Additionally, it simplifies my life. I generally know when to cut my hair, and when to grow it. When I do cut it, the options are limited. Most times, the minimum required length determines the hairstyle I receive. I usually don’t care too much about it. I try to remember that hair is just hair and it will grow back. The act of cutting my hair reminds me to care more about who I am and how I treat others than about how I look. It’s an extreme form of intentional action. I am grateful for the gift of hair, but am even more grateful that I am able gift it and let it go. It’s all just another part of creating a lifestyle by design. We all think that with the holidays ending, there’s going to be an opportunity for slow. A blank canvas for mindfulness. A time for new beginnings, ready to leave the hectic, rushed and busy season behind. Instead we find ourselves diving headfirst into the list-making. Maybe not for gift-giving for others this time around, but rather, gift-giving for ourselves. For the life we want to lead. We drive to the car wash, rush to the hair salon, hit the yoga mats. New year, new me. Old rhythm. Here’s the thing. Beginning with the beginning is the same as beginning the way we always have. We have new hopes for a bright future, but our tendencies keep us from making any real change. Some New Year’s advice? Go backwards. Beginning with the end changes everything. If you interview anyone who ever experienced a tragic event, an untimely death, a natural disaster, they will likely begin their story in much the same way. That single sentence alone tells us all that we need to know. It tells us of the ordinariness of events. It tells of the human tendency to take daily occurrence for granted. It tells of a mortality that easily escapes us. And it tells of the unexpected end. This year, I implore you to begin at the end. Right before we began our married lives, a few months before we embarked on our journey to freedom, we invested in our finances. The value of having a CFP such as Andrew could not be over-emphasized. The most important thing Andrew did for us had nothing to do with money. The first exercise we did together involved sitting down at a turquoise green dining table that I scrounged from a consignment store five years earlier and beginning with the end. In lieu of marriage counseling, we were talked about our deaths. If it were only a month? If you were to die tomorrow? If you died right this second, what would be your biggest regrets? Not quite the easiest questions to answer on the spot! I would recommend some serious mulling over, because these are questions worth answering. This is why our journey is not just about numbers and money. This is why we focus on experiences over material goods. This is why the community we’ve built is more important than the accolades we’ve racked up. This is why the things we own must be only that which we love and nothing more, and the things that we buy must do good for others and for the planet. Because if you ask people about their death, you will see that the life they wanted to have led does not line up with the way they are currently living. They may say they want financial freedom, but refuse to manage a budget. They may say they want to lose weight, but refuse to go to the gym every day or alter what they eat. They might say they want to travel the world, but tie themselves to a 9-5 that only gives 2 weeks of vacation a year. They might say they want to focus on family, but focus on material goods instead, thus taking them away from their homes and forcing them to work for said goods. They may say they want to pursue a passion, but never invest, never take that leap. I say, I want to live an intentional live. I say, we aren’t promised tomorrow. I say, it was never about us, for we are transient beings. It’s about what we leave behind. I say, if you want to write real resolutions, you begin with the ending. A practice that I encourage people to do is to write their own eulogy. If you were to die, how do you want people to remember you? What do you want people to say? Limit it to four sentences. Ideally, revisiting it once a year would be great. And then ask yourself, is what I am doing today reflecting what I want people to say? I guarantee you that you will see your resolutions change. I am the first to say that I am entirely unqualified to be giving this advice. I have not been remotely near the dating scene since before dating apps were created. I met my husband in our college days, when it was still common (and easy) for you to meet a significant other at a party or a social gathering amongst your group of friends. It was a time in our lives when we still felt the presence of a local community, which commonly vanishes as younger generations age and pursue careers and passions that take them away from a core group. I am not qualified because, frankly, I have never swiped right. Yet a surprisingly large number of people are inquiring about this particular topic, seeking sage advice. They ask how to be frugal and still date. They ask how to practice slow living while developing relationships. They ask how to pursue financial independence and not be weighed down by a partner’s habits. While I cannot guarantee you that I can fit the bill in answering all of these questions, I do have a few thoughts as to how I would approach the scene today, as a person seeking slow-living, frugality, and financial independence. Where to begin? I guess I should start by saying that there is a difference between people who date so as not to be single, and people who date with the intention of finding a significant other. I am assuming that those people who are dating so as to not be single are not the ones writing to me for advice. I am speaking of a long-term relationship built on the intention of creating a deeper understanding of another human being. Here I will be discussing my thoughts on a number of different topics. It’s a fast-paced world. Our lives are muddled by obligations such as work, family, school, social events, social media, et cetera. Who has the time to sit down and actually get to know anyone anymore? Who has the time to be present and to simply observe, without feeling the need to make a move? Not many, I presume. Enter dating apps. The faster way to find your next life partner, amongst the millions of potential people. The apps themselves try to speed up a process that is meant to be slow. You have two seconds to make a first impression on someone before they choose the direction in which to swipe. In come cases, that impression is based on something entirely physical, such as the photo you choose to share. I am not saying physicality has nothing to do with dating (it DEFINITELY plays a role), but the decisions being made are sometimes based on the physical aspect alone, which is hardly a strong foundation to build upon. In other cases, the apps act like a filter. You read through a resume, like you would at work. You choose a person that seems to fit the bill. But even that isn’t enough. Despite the fact that you have similar hobbies, interests, or backgrounds, there are so many other complex parts of a human being that cannot be written in a resume. Some of which you need to discover on your own, in due time. Who knows how they will react to a certain situation that isn’t going to come up until a few years down the road? You may both love music, but one might need a larger amount of personal space than another. Off course, it isn’t realistic of me to say that everyone should do away with the apps. I met Mr. Debtist in an environment that was very conducive to meeting new people wheras today, our lives are less conducive to seeing new faces. The problem is that as we become more focused on work and making money, on being self-absorbed in social media, on independence rather than community… we as a society are getting further away from any real human interaction. Here’s what I would have to say about dating apps. If it were me, I would do away with apps. Instead, I would revert back to the olden way of doing things. Get out there, and truly socialize, not to meet people, but for yourself! Do things that interest you. Volunteer at events that you believe in. When someone invites you out with their friends, don’t deny them just because you won’t know anyone and would feel awkward. Be comfortable with putting yourself out there. Return back to being a social human being who thrives off of social interaction. What this does is it forces you to surround yourself with PEOPLE. Maybe like-minded people who you can easily connect to at a volunteer event. Maybe non-like-minded people who inspire you to look at the world in a new way at a friend’s gathering. Additionally, don’t approach meeting people like you would a job opportunity. Don’t talk about yourself and who you are and what you’ve accomplished. Don’t ask about their job. Talk about what fuels you. Listen to what fuels them. Discuss ideas, not people or things. Ask questions. Actually… ask plenty of questions, even the hard ones. We used to know how to open doors by asking questions as children, and we need to learn it again as adults. There is an easy way to plan a first date. You take a pre-formed concept romanticized by media such as movies or music videos and you do exactly that. In fact, that’s what most people do. They meet up for coffee, or go to dinner, in the hopes of interviewing their way to knowing you. Some get more extravagant and include activities such as watching a movie or taking a cooking class. None of these ideas are frugal, especially when you expound it over multiple first dates. Well here’s a thought. Get to know them before going on a first date. Seriously! Talk to them. Ask questions. See what they like to do. Figure out if there is a common ground, and then find a great way to start with that, instead of just plugging them into the automatic coffee date spot that you’ve taken everyone else. Mike and I talked for hours every night on AIM, which ages us I know. It took us five months of getting to know each other before deciding to date. Once you find a common ground, create an activity out of it. For example, did you both used to play soccer? Meet up at a park and practice. Do you both own pets? Take your dogs to the beach or a dog park. Go on a dog walk. A twenty minute dog walk gets the chore done and allows you time to chat. It shows you how you care for your pets. Here is a short list of free frugal first dates, if you still don’t have a clue. Go on a hike or take a bike ride. Find a free summer concert in the park. Find an outdoor movie screening. Check out a local farmer’s market. get to know the vendors, and try samples. Wander art galleries (preferably on art walk, when they are free). Walk or Visit dogs at the shelter. Play a boardgame at the park (actually finish a Monopoly game!). Build sandcastles at the beach. Lastly, just do ANYTHING. Stop thinking so hard. Dates are highly romanticized acts. If it gets too complicated, you’re already taking away from any real connection. Is it bad advice to say, just meet up and talk? Why do younger gens writhe at the thought of inviting potential prospects to an already existing event, with family or friends? Mr. Debtist and I skipped all the superficiality and honestly, I think that’s why it worked out so well. So you pursue financial independence. How, then, to bring that up without frightening away any prospects. It’s hard enough bringing up the subject over happy hour with your closest friend, favorite cocktail in hand. Harder still when you’ve got to let someone know of your plans, if ever they want to be a part of it. Here’s what I got to say. I do agree that your new potential significant other should know fairly early on your values, your goals, and your dream future. To withhold that from them would be unfair. But do so with your actions, rather than your words. If you somehow meet a spend-thrift, don’t immediately assume that they can’t be the one. I am the first to say that I was a frivolous consumer, and had the IQ of a rock when it came to finance. But I changed too, over time. I changed as I spent more time with Mr. Debtist, who is the frugal OG, and I started to see the benefits of a financially independent lifestyle. You can have conversations about what you can both work on, but please keep the expectations at a minimum. Because the truth is, people won’t change for you. And should they have to? Rather, people change for themselves. They have to want financial independence, too, on their own terms. And if they don’t, then yeah it may make it harder for you or it may take you a few more years than you originally planned, but perhaps it’s worth it. As I say time and again, it isn’t all about the money. Now, let’s say you are the stubborn type. You want to have financial independence gosh darn it, if it kills you. Okay, fine fine. There is a way, but it requires you to know your significant other really well. If you want to have them on board, you need to stop thinking and talking about yourself. You may want financial independence because you hate your job or want to pursue a different passion. But that’s not going to get your significant other to magically also want to quit work forever. Like I said, people change for themselves. You need to do some serious brainstorming and think of what your partner wants more than anything. Is it to be a stay-at-home-parent? Is it to travel the world? To work pro-bono in a third world country? Whatever it is, you need to convince them that financial independence can help get them there (because it can!). Andddd you need patience. Sorry, but it’s true! It isn’t going to happen overnight. My most sage advice? Ultimately, it does not matter if they ever become a frugal weirdo or a financial freak. What matters most is that they are willing to compromise and to be supportive. That’s really all I have to say. It seems too simple to be true, but in my life, most things just are. 2018 for us was the year of less. I would say that it took a year of experimenting after dental school until I finally found my focus. This past year was the second year since leaving school and it was also the year that I finally identified myself as The Debtist, accurately reflecting just how much the student debt has shaped my life. When I left school, I was suffering from a feeling of overwhelm, and not just because I was an introvert. There was just too much of everything. Some were good, like accomplishments and accolades that I was proud of, but with the good comes the bad, such as obligations tied to those accomplishments and accolades. I owned too many things, knew too many people, had too many social events to go to, and I was drowning in debt. After a year of soul-searching and experimental living, we finally found our groove and spent all of 2018 perfecting our lifestyle by design. Here’s the truth. Balancing all aspects of your life can be exhausting. Trying to make sense of your financial life can be difficult enough as it is, especially if you are trying to control your spending, get rid of debt, save for a financial goal such as a house or your child’s college tuition, and plan for retirement all at the same time. Imagine doing so while balancing a job, spending time with your friends and family, and stealing time for your own health. Oh wait, you probably don’t need to imagine. Where, then, do you have time to add to your life? By the time the work day is over, most Americans are just praying to get to bed at an early enough hour in order to do it all over again the next day. Some desperately crawl their way to the weekend ahead. That’s not the life I want to live. I can argue that’s not much of a life at all. The problem is, the American Dream emphasizes the importance of having more to the point where our lives are over-extended balloons and we are all about to pop under the stress. When in reality, we can all benefit from less, and simplifying our life is one of the best ways in which we can enhance our focus, reach our goals, relieve our stress, and take our life back. The average American lives surrounded in clutter, both physical and mental, completely unaware. I know I was. Clutter comes in many forms. It can manifest as excess stuff in our homes, uncontrolled spending and consumerism, unhealthy relationships and habits, debt (can I get an Amen?! ), unwanted obligations, unsatisfying jobs, mental clutter in the form of anxieties and worries, digital clutter, and more. Controlling all of this clutter can make life very chaotic, and when life is chaotic, it’s hard to focus on things that actually matter, such as close relationships, health, and personal growth. When I graduated, I didn’t know that I was suffering from excessiveness but I knew I had to change something or go ape. I landed on simplicity, accidentally, and it was my saving grace. After an entire year of stripping our lives to the barest minimums, we found that bare minimum kind of suits us. We de-cluttered, dropped relationships, said no to a million obligations, rejected lifestyle creep, avoided consumerism and subscriptions, and meditated and created our way to unearth versions of ourselves that were buried beneath all the responsibilities; versions that were unable to be born and grow under all the stress and the duress. What resulted was not only a self-discovery but also a forming of community, interested in our lifestyle. It shows that many people are just searching to be humans again, to escape the hamster wheel, the robotic interactions, the black hole of the American Dream that is so difficult to escape. Soooooo maybe 2019 is the year to simplify, if you haven’t experimented with it already. Simplifying looks differently for everyone, but here are some processes that I addressed in order to simply my life. I hope it finds you well in the year to come. De-clutter (or downsize!) in 2019. This addresses the physical aspect of clutter. Studies have shown that houses full of clutter actually affect our ability to connect with our homes and prevent us from associating the home with a place of refuge from the outside world. Meaning, having too much stuff surrounding us keep our minds constantly over-whelmed with stimuli, and thereby prevents us from fully re-setting. Additionally, cleaning up after our stuff takes up a lot of time when we just have too much. Plus, we have to deal with the paradox of choice. Having less stuff simplifies the decision-making process of trivial things (such as what to wear today), thereby allowing us to focus on making decisions for more important, and bigger life commitments. Lastly, de-cluttering (or down-sizing your home) will save you money, too! There are many pros with small-space living, and simplifying your life is just one of them! To read more about my thoughts on less and happiness, right this way. Spend less time on social media. Logging off is one way to eliminate mental clutter. I’d be the first to admit that my ten fingers are miraculously glued to my phone. But after an experiment of logging off after a month, I was suddenly reminded of what life was like before I was endowed with constant connection abilities. I started to have time for things that I used to say I did not have time for. I even had so much time that there were moments where I had to sit and think of what to do! The average american spends 5 hours a day on social media. FIVE HOURS!! I mean, don’t get me wrong. I love connecting to friends, family, and you, readers, through social media. But there are days when I am seriously scrolling down my feed, eyes glazed, just because I had a long day of work and needed to soothe my tired brain with photos of pretty things and videos of cats. Hardly productive. I could have instead taken a nap and been energized from the rest of the day., I liken social media to useless carbs. We consume them because they make us feel good, but there is no way it’s good for us in the long run. Watch less Netflix/TV. We do not have cable, or a television for that matter. In fact, we lead a life of absolutely no TV. It saves us money, but more importantly, it saves us time. Similar to the social media rant, TV is one of those easy solutions to top off a stressful work day, but it’s a time waster. The average American watches 35 hours of TV a week, which I cannot even fathom because TV never was a big factor in my life. But I do believe it, since every social gathering has someone bringing up the latest news on TV or the most popular TV series. People even talk about funny advertisements, or trailers of new movies. And honestly, we can’t relate. Which is pretty awesome, because people ask about our lifestyle without TV and start to drift into topics of travel, being with family, tapping into creativity, and more. Sometimes, we even drift into politics, but rather than talking about what a politician just recently said or did, we talk more about the futures we want to see, and brainstorm our own imaginary solutions to problems that society faces. Instead of talking about other people’s lives, we become introspective of our own. Evaluate your relationships. We all know what unhealthy relationships are like. There are social obligations that we keep out of sentimentality or fear of cutting ties completely, but when you reframe your view and realize that these relationships can be keeping you from your potential life, it becomes much easier to let them go. You don’t have to do it in any awful way and the ties don’t have to be severed on bad terms. We’ve all had a falling out over time and it’s not that you don’t like that person, but just that they don’t really fit your lifestyle in this moment. They could have had a place in your past and maybe they will also have a place in the future, but maybe now is not the time. If they are your true close friend or family, they will understand the boundaries that you set. Evaluating relationships will let you know which are really worth your time. It gets rid of those social events that you dread going to, the awkward moments when you can’t connect with someone, or even the frustrating and bad moments where the drama happens. In the words of Bob Ross, “I can’t afford to hate people. I don’t have that kind of time”. Get rid of debt. I can talk all day about this. In fact, I’ve talked ALL YEAR about this. Debt can be restricting, taking away the freedom to live your life to the fullest. Especially when the debt is large like ours. It doesn’t matter if it’s student loan debt, credit card debt (ick! Those interest rates! ), car debt, mortgage loans, or business debt. All debt is bad debt. Paying off all of your debt will greatly simplify your life. You will get rid of monthly recurring payments and you will alleviate some of that stress handing over you. Talk about mental clutter! Plus, getting rid of debt will give you more money to set-aside for longer-term financial goals, such as saving for retirement or investing for the future. 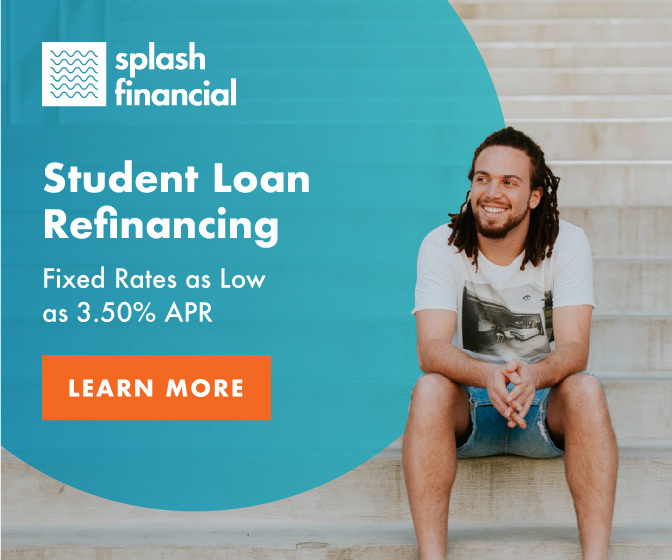 If you have a large student debt hanging over your head like me and are ready to just get rid of it completely, try considering refinancing or switching to a different repayment program to save you BIG BUCKS. Organize, automate, and track your finances. Automating our financing has helped us a lot. Getting the help of a financial planner was the first step. Then we got our budgeting down with YNAB, which has helped us tremendously in paying down over $100,000 in student debt! We got rid of credit card debt (see #5 above), and automated all of our recurring monthly payments. We have focused our sights on paying down student debt, but have done it in such a way that we hardly have to think about finances at all. Everything is on auto-pilot, and the consistency of our work has showed some great results! Stop searching for external sources of happiness. There are three things we are constantly being sold: time, money, and happiness. Advertising agencies know that in order to sell a product, they need to frame that product in a way that makes life more convenient, richer, or happier. Many people subconsciously believe that they would be much happier if only they had a new car, or a home, a new tech gadget, or even something as simple as a new outfit. But we need to stop searching for external sources of happiness. We can’t just buy our way into being happy. I mean, I guess we caaaaaannnn, but that also means we are spending unnecessarily (and constantly!) whiletying ourselves more to our jobs than we need to. Happiness is a mind set. You can cultivate happiness with something as simple as a breath. Stay organized. I streamline my life in as many ways as possible. In order to do that, I try to stay very organized, which is very difficult for someone endlessly overflowing with ideas and thoughts! I carry a planner with me at all times, and jot down any notes or errands that require noting, before it slips away into the recesses of my memory, waiting to be discovered at the most opportune times. If you aren’t the type to keep a planner, maybe 2019 is the time to start (right this way!). I mean, when you look at the following statistics, it’s hard to imagine why you wouldn’t want to be more organized! The average person spends 12 days per year looking for things they can’t find. Every day, the average office worker spends 1.5 hours looking for things. In a recent survey, 55% of consumers stated they would save anywhere from 16 to 60 minutes a day if they were more organized. 23% of people pay bills late and have to pay late fees because they are unable to find their bills. Practice saying no. Saying no is probably the best super-power in the world. That and teleportation, which I have yet to meet someone who has discovered just how to make that dream a reality. Saying no kind of gets a bad rap, but it seriously shouldn’t. Think of saying no to things as the equivalent of saying yes to other (more important) things. We live in a world where saying no means that you aren’t capable, and I say to that, SO WHAT?! We are human. We aren’t capable of all the expectations that society sets up for us, because to be frank, they are perfect little impossibilities! Instead of stressing ourselves out by adding as much as we can to our plates, and then some, we need to start limiting what we introduce into our lives to those that add meaning. Be kind to yourself. It is human nature to be too hard on yourself but a great way to simplify your life is to be kind. Sometimes, we grade ourselves using a metric system that is extremely difficult to beat. It is easier to be forgiving of others but when it comes to ourselves, we are our own worst critics. We need to trust that we are where we need to be, and that we are enough. Stop comparing yourself to people in tiny perfect squares. Simply trusting the process can get rid of the anxieties that we typically face, and the negative thoughts that we have towards ourselves. Avoid multi-tasking. It can seem like multi-tasking is the best thing to do when life gets busy but multi-tasking can actually make life more difficult. Studies have shown that we are not built to multi-task. In fact, we cannot truly multi-task. Our brains can only focus on one thing at a time and when we think we are multi-tasking, we are really just switching from one task to another, at a very fast pace. Talk about over-stimulation! If our brains are trying to do ten things at once, we actually slow down real progress while putting ourselves under a lot of stress. Focusing on one thing at a time will deliver better results and will help with the mental clutter. Make your money work for you. I am all about passive income streams. I want my money to work for me, and not the other way around. We all need money to uphold a particular lifestyle. However, I don’t want to spend my entire life trying to make money. Instead, it’d be nice if the money makes itself, without me having to put in too much work. Investing is one way to make your money work for you. Mr. Debtist and I are in the habit of paying ourselves first. Before we even get a hold of our paycheck, we take away a percentage of our income and stow it away in our 401ks. Another way we make passive income is by co-housing. Each month, we earn $700 just by letting a roommate live with us. Sometimes, we let dogs stay with us too, via Rover, and that’s another way to earn money (almost) passively. If you feel the same about work, maybe this is the year you start looking at passive income! Meditate. I used to have a monkey mind, jumping from one thing to the next. I used to live in the past and in the future, but never could keep myself in the present. Meditation was the best way for me to get rid of mental clutter. Deep breathing techniques and yoga are two ways I calm my mind. Sitting silently and reflecting, or practicing gratitude are other ways to hone in your focus. You may find that meditating allows your mind the space it needs to finally get something done! How about you? How are you planning to simplify in the New Year? I recently wrote about how we could use gifts as a way to change younger generations’ perceptions of STUFF, but today, I want to share how we (now) can use gifts to help shape the tomorrow we want to see. Here are some gift ideas to help those around you curb their waste in the new year. Not only could it save them money by eliminating single use items from their grocery lists, it could do the environment a world of good. How about you? What are some favorite eco-friendly gifts on your list? I am not one to take in an eye-sore kindly. I would call that one of my biggest flaws. Things just have to be aesthetically pleasing to be pleasing to me. For that, I am sorry. So when it comes time to start putting presents under the tree, it follows that I cannot just shove them there, unwrapped. It isn’t that I feel the need for another person to be surprised, although surprises are quite nice. It’s that I need the presents to look cohesive, for my own sanity. Which brings me to the following dilemma: less waste for a time of the year when gifts abound. + Less gifts, in general. Call me Einstein, but with less gifts comes less gift wrap, and therefore, less waste. This year, I have narrowed down our gifts to ten. That includes required Secret Santa’s at work and holiday parties, and our most immediate family members. Part of this comes from our public renouncement of the gifting of material things, right this way. + Simple methods of wrapping. One of the very first memories I have of being conscious of my wasteful lifestyle involves wrapping gifts at Christmas time. I was 20 years old and I had volunteered to help my aunt wrap the gifts for my cousins (all forty-something of them). I was previously taught by my mother how to make gifts look pretty by adding in additional folds in the wrapping paper and using multiple bows. By scrapping sticker tags when my hand-writing was too ugly to bear. I went about my usual methods of wrapping gifts when my aunt questioned why I was folding the wrapping paper in such a way. I replied, “Because it looks pretty.” To which she laughed and said, “It wastes paper.” Confused, I didn’t understand why that mattered. Off course, my mind mulled the comment over and over again in my head as I continued to wrap. By the end of the wrapping session, I was embarrassed at the waste of gift wrap that I had cost my aunt. I was embarrassed of my frivolous lifestyle. And I saw a glimpse into the world of minimalism that I had yet to discover. Nowadays, I just wrap the paper once around, barely enough to cover the good, and call it a day. A more refined self finds this way of wrapping more attractive anyway. + Simple materials. I avoid plastic as if I was allergic to it, that you may already know. These days, I find comfort in choosing materials that are natural, biodegradable, or at the very least, recyclable. For Christmas this year, I’ve stuck with twine, string, paper wrap (the non-glossy kind), brown boxes, and re-usable stamps. The color scheme itself is simple, making it easy for me to satisfy my need for cohesiveness. To fill excess spaces in the boxes, I’ve opted not to purchase tissue paper, but rather, use left-over packing paper that has survived our move into our new home a few months ago. + Less wrapping of the gift wrap themselves. If I have to buy gift wrap in order to appease my need to have everything look cohesive, may it be the least-dressed gift wrap there is. This tip goes out to the minimalist (or minimalist hopefuls), to the environmentalists, to the pursuers of mindful living. This year, I went to a local stationary store (and by local, I mean I live across the street from it), and chose a brown paper gift wrap rolled up sans one of those cardboard rolls that you typically find in the center of a tootsie pop wrapping paper. Additionally, it was not wrapped up in cellophane, as they usually are. It was held together by a piece of paper detailing the company from which it came. I also purchased paper tape, with a little green decorative charm, holiday-esque enough to spruce up plain brown boxes (see what I did there?). I purchased yarn that was wound around a cardboard roll, and without the plastic covering (why are they even necessary?!). Lastly, I whipped out my wooden stamp collection and cut up a piece of sketch pad paper to make the name tags. All of this to say, it doesn’t take much to appease my need for pretty. We don’t have to indulge our presents in excessive gift wrap, but I am completely okay with allowing myself something simpler. It’s not perfectly zero-waste, but we can’t always be beating ourselves up for their inabilities to be perfect. We are, after all, human. The point is, we try. Finances: How YNAB Helped Us Pay $84,000 Towards Student Loans in One Year!